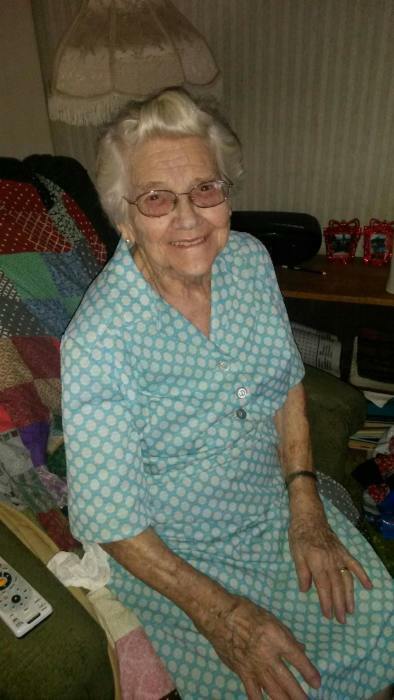 Vianna Bagwell, age 94 of Covington, formerly of Bradford, died Saturday, February 10, 2018 at her home. She was born June 24, 1923 to the late Orie & Luella (Michael) Longenecker in Darke Co, OH where she was also raised; a graduate of Franklin-Monroe High School; a member of the Bradford First Baptist Church; & she loved to sew. Preceded in death by her parents; husband Carroll W. Bagwell in 2005; son, Byron Carroll Bagwell; granddaughter, Denae Enfinger; grandson, Christopher Ditmer; 3 brothers, Floyd, Emerson & Lowell Longenecker; & 3 sisters, Edith Stryker, Edna Schaurer & Naomi Hines. Vianna is survived by her son, Dwaine Lee Bagwell of Covington; 3 daughters, Alice June Enfinger of San Antonio, TX, Joyce Ann (Terry R) Miller of New Madison & Dianna Sue (Marc) Foster of Bradford; 10 grandchildren, Nicole Enfinger of San Antonio, TX, Katie (Jack) Besecker of Versailles, Steven (Michelle) Ditmer of Arcanum, Derek (Kristen) Ditmer of Columbus, Jeff Ditmer of South Charleston, Susie (Michael) Smith of Branson, MO, Leslee (Jacob) Mercer of Troy, Megan Foster of Greenville, Caleb (CoraJo) Foster of Ludlow Falls & Carol Foster of Columbus; 9 great grandchildren, Brant Colton, Justin & Sean Besecker, Kaitlynn Litts, Jacob & Elliott Ditmer, Jackson, Evan & Corben Mercer; brother, Elmer (Delores) Longenecker of Piqua; many nieces, nephews, other relatives & friends. Funeral Service will be held Wednesday at 10:30 am at Stocker-Fraley Funeral Home, Bradford with Pastors Mark Lynch & Caleb Foster officiating. Interment Miami Memorial Park Cemetery, Covington. Visitation will be held Tuesday 5-8 pm at the funeral home. If desired, memorial contributions may be made to the Bradford First Baptist Church, 134 W Walnut St, Bradford, OH 45308. Condolences may be left for the family at www.stockerfraley.com.